There’s even great horseback riding in Hot Springs! 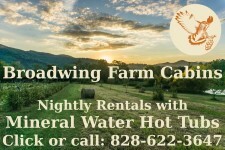 Whether you are searching for an outdoor adventure, a relaxing soak in our natural mineral Hot Springs, or an evening out with friends and family, you will find yourself refreshed and invigorated by the beauty and charm of Hot Springs, North Carolina. Looking to relax? Treat yourself to a soothing soak in the natural mineral waters for which Hot Springs is famous. For a little extra bliss, pamper yourself with a spa treatment or massage as well! Enjoy a night out at one of Hot Spring’s local restaurants. You’ll find live music, craft brews, and delicious food to nourish your day’s expeditions. 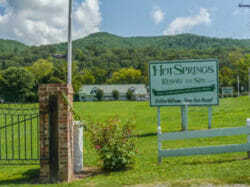 Come enjoy Hot Springs, NC and leave in a Better State of Mind! There are relatively few sources of geothermally heated mineral water in the Eastern United States. Hot Springs, North Carolina, is fortunate to be one with hot mineral water that is the perfect temperature for a comfortable soak. The water coming from a hot spring is heated by geothermal heat. In general, the temperature of rocks within the earth increases with depth. If water percolates deeply enough into the crust, it will be heated as it comes into contact with hot rocks. Because heated water can hold more dissolved solids, warm, and especially hot springs often have a very high mineral content, containing everything from simple calcium to lithium, and even radium. Hot Springs, North Carolina, has a rich history as a center for healing and retreat. Traders from the colonies were the first to visit the springs and, by 1778, the lame and the sick were traveling over the mountains for the healing waters. On March 19, 1791, William Nelson bought the hot springs property for “two hundred pounds in Virginia currency” and began catering to the visitors. In the 1800’s, a series of three hotels were built to accommodate visitors who came for the clean mountain air and to soak in the springs. In fact, the healing history goes back even farther than that: The town’s hot springs were first discovered by Native Americans who believed the springs possessed healing powers. Signs of Native American presence here date back nearly 5,000 years to 2,500 B.C. on petroglyphs that can be seen on Paint Rock, a 107-foot rock cliff which researchers believe Native Americans used as a stopping point for prayer and contemplation on their way to the springs. What you don’t bring with you to Hot Springs can usually be bought locally. You won’t find any malls or outlet stores, but rather a unique array of locally-owned businesses with offerings for residents and visitors alike. Visiting the outfitters is a fun experience for people of all ages and interests. You’ll find displays of great equipment, unique gifts and clothing, and you’ll no doubt run into some hikers in the process. There are a number of shops where you can find local crafts or gifts for friends. We also have an ice cream shop, a coffee and latte bar, a wine shop and an antique and consignment shop. We also have something that is close to extinct: a couple of family-owned hardware stores that also stock some gift and clothing items. You may stop by and browse to get a true flavor for the community as people come and go. The shopkeeper will spend whatever time it takes to find what you need, even if it costs only 50 cents. Hot Springs has one gas station stocked with sundries. Our local market has a surprising selection of groceries, including locally-grown produce and fresh fruit. When visiting Hot Springs, NC, you are in for a pleasant surprise! You will find a variety of unique restaurants serving fresh and creative cuisine. Some even have occasional live music which can be found on our events calendar. Hot Springs, North Carolina is host to a rich array of arts and culture events. Being tucked up in the amazing Appalachian Mountains has only spiced the cultural spectrum, both traditional and new. Everything from River Festivals to traditional arts festivals, social justice events to motorcycle rallies; many of which support local artists, community and nature while drawing speakers, thinkers, artists, musicians, competitors and more from the nation and world-over. An art, music and story-driven transformational experience grounded in faith-inspired social justice. A celebration of the Appalachian Trail and Outdoor Recreation. Enjoy Live Music, Speakers, Food, Games and more. Happening in April when many thru-hikers pass through town. Some of the region’s best Traditional Old-Time and Bluegrass Music, ballad singing and clogging followed by an evening Square Dance until dark! Bring the family and the lawn chairs to enjoy a day full of music under the shade trees! 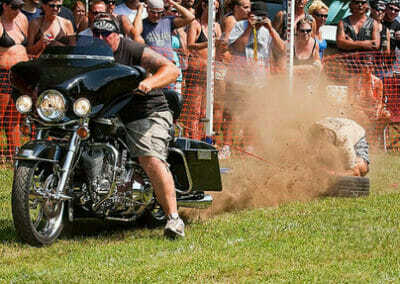 A motorcycle Rally complete with live music, Bike Games, a Bike show, Vendors and plenty of good times! Presented by: Buncombe County Concerned Bikers Association/ABATE. Come enjoy live music, a great outdoor gear live auction, and arts and crafts vendor offerings as well as the “Paddle with the Pros”, the Annual FBRF Mountain Bike Race, or the Annual French Broad River Raft Race. The festival is a benefit for American Whitewater, The Verner Center for Early Learning and Hot Springs Community Learning Center. 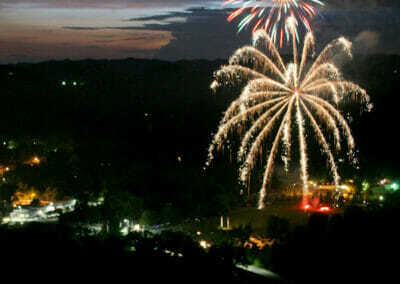 The town of Hot Springs Town and local Fire Department join forces for the annual patriotic display which can be viewed from right down in town, or from romantic look outs surrounding hot springs. Consider making hot springs a part of your summer holiday!